Oh to be in Cambridge, now that April’s here! The sun seemed to shine with increasing warmth as my train journeyed through increasingly flatter land. Although I have great affection for my new home, Sheffield, the annual Gatsby Plants Training Weekend is an event I would happily travel much further for. Sometimes, we plant scientists can feel as a minority group in society, so it is wonderful to come together (in the protective environs of Jesus College Cambridge) for encouragement, socialising and to discuss fascinating science! On arrival, I had time to pop into the Sedgwick Museum of Earth Sciences to admire the ancient Lepidodendron fossils from the Carboniferous period. In the absence of flowering plants and 'modern' trees, the horsetails were the dominant form of vegetation, unlike today where they are often treated as an after though in the plant kingdom. I always enjoy peering at the scale- like depressions on these relics that mark where early leaves would have attached and the circular scars left by former rootlets. Ghosts of the past, these call us to pay homage to how plant form and function has stood the test of time. I then took a short excursion to the Whipple Museum, a little- known collection of historical scientific instruments and teaching aids. I am intrigued at the sense of artistry often found associated with old scientific instruments, which seems absent in the mass produced, anonymous tools of today. Here, I could admire beautiful anatomical models, each one a delicate work of craftsmanship, sextants and astronomical devices with painstakingly worked engravings, microscopes worked out of glowing brass.... And yet perhaps there is a resurgence in pairing science with art. Microscopic images, be they of bugs, diseases or pollen grains, frequently feature in national newspapers and scientists are increasingly engaging in alternative visual methods to demonstrate their science. In the Wellcome Collection in London , for instance, the human genome is reprinted as a series of books... a very powerful image of how much 'code' each of our cells packs inside the nuclues! The very fact that you can now buy 'toy' microbes and diseases ( see http://www.giantmicrobes.com/uk/) demonstrates that science is an embedded feature of popular modern culture! A teaching aid showing a ' typical ' animal cell, Whipple Museum, Cambridge. I couldn’t distract myself for too long however as I had to settle into “scientific presentation mode”. Each PhD student had been asked to prepare an 8 minute powerpoint presentation on their projects, to be followed by 4 minutes for questions. I was hoping that I would score some “novelty” points for working on parasitic plants but worried that I would be confronted with technical enquiries that were out of my depth (4 minutes is a long time to be interrogated!). I barely had time to drop my bag off in my room and grab a cup of tea before we launched into the talks. If I had been doing my project in he 1960s, I might have used one of these instead of a mass spectrometer! This 'Electron Microbe' was then the most advanced method of determining the chemical components of a sample. In the column on the left, the sample would absorb energy from a bombardment of electrons, some of which would be re-emitted as x-rays. The energy and intensity of the radiation would depend on the composition of atoms in the sample, hence by measuring this, the chemicals in the sample could be determined. It was intriguing to see the broad range of topics we covered between us, whilst still remaining firmly embedded in the plant sciences. Everything seemed to be represented – plant development, symbioses with nitrogen-fixing Rhizobium bacteria, hormone gradients, photosynthesis, algae, carnivorous plants… I was especially interested in Emily Seward’s introduction to the “phantom parasite” Phytomonas – unicellular organisms with a distinct corkscrew shape and flagellate tail. Their reference to phantoms is due to the fact that it took scientists a long time to identify these parasites as the causative agents of major plant diseases including cassava root rot. This was partly due to Phytomonas occupying parts of the plant – such as latex tissues and phloem vessels – not typically associated with parasites. Interestingly, these organisms are kinetoplatids, belonging to the family Trypanosomes, whose members include the vectors behind more well known human diseases, such as Chagas disease and sleeping sickness. Emily’s talk was inspiring and I am certainly keen to learn more about these parasites. To me, it embodied what an ideal scientific presentation should do – introduce the audience to a new area of science that leaves them hungry for more! Recognise me? One of the reasons I have great affection for Jesus College Cambridge, is the statue in the front courtyard (left). 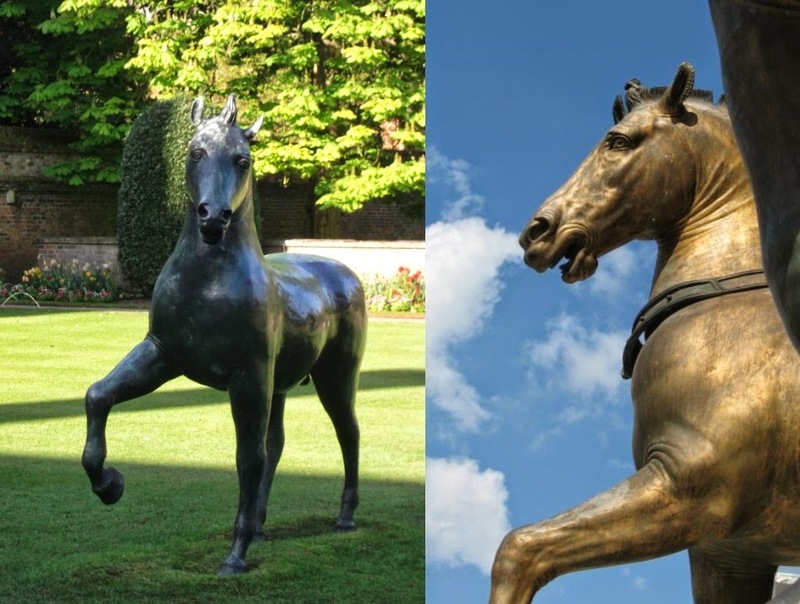 Anyone who has seen my Facebook Profiles will know that I have a slight obsession with the city of Venice and this sculpture is modeled on the Horses of St Mark's Basilica (right), originally looted from Constantinople. Technically, there should be four horses striding across the lawns at Jesus College but I find it so charming to have even this Byzantine influence from across the Adriatic... if I ever win the lottery, I shall commission a set for my garden! I was disappointed with my talk, both with my delivery ( stumbling over the odd word) and how I handled the questions ( I realise that I could improve my knowledge on the more technical details of MALDI-MS). At least I managed to get the words out although I was extremely put off when I realised that we were being filmed! My strategy for giving presentations is to try and learn my words by rote but I do worry that this makes me sound too 'mechanical'. As though I am not even interested in what I am speaking about. ( and nothing could be further from the truth!). Certainly the most engaging speakers this afternoon had a natural style and gave the impression that they could talk about their work at any time, in any setting as they were so familiar and comfortable with it. A level to aspire to, in my case! As mine was the last talk, everyone's thoughts are probably already on dinner, a formal three course meal we enjoyed in the upper hall. The after dinner speaker was Michael Akam, a developmental biologist whose papers on Hox genes I remember studying for my final year undergraduate exams. Through his own diverting career he was able to give some sage advice to the assembled PhD students. Mainly, to KEEP GOING and accept that there will be weeks at a time when nothing will seem to go right. It is all very well to get the interesting result you were hoping for but to replicate it is quite another thing again! He also encouraged us to make sure we chose an area we had a real attraction to : there is no point investigating an answer to a question that we are not personally interested in answering. Meanwhile, he also emphasised how important it is to capture the imagination if others with your science. He pointed out that palaeontology never ceases to attract funding, despite the fact that studying dinosaurs could have little 'useful' application in the modern age. I think Jurassic Park has a lot to answer for this!